Launched in 1996, Amazon Associates is one of the world’s first affiliate programmes – and it has grown to become one of the largest free programmes of its kind in the world. An affiliate programme is an arrangement which enables website operators and bloggers to monetise their site using easy-to-create Affiliate links. When a visitor to your site or blog is directed to Amazon.co.uk via an Affiliate link on one of your pages, you’ll receive a reimbursement of advertising costs for all purchases that your visitor subsequently makes on Amazon within a 24-hour timeframe. The fee you earn is between 1 % and 12 %, depending on the type of product (product category). 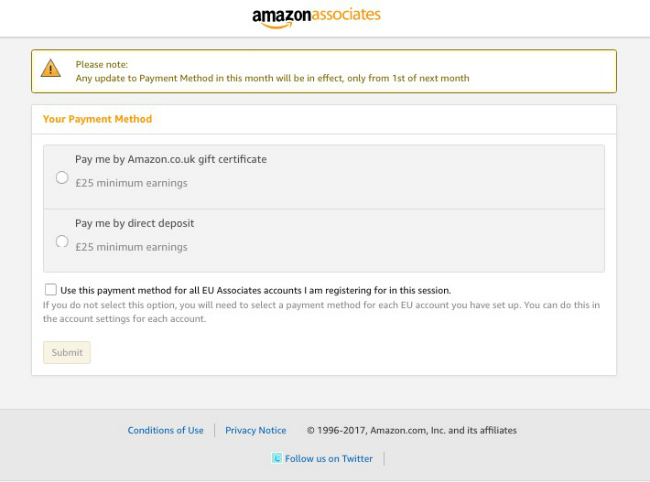 Signing up through the Amazon Associates website differs from other affiliate programmes, because you can use your existing Amazon login: your existing Amazon account information will be linked to your new Associates programme account. There’s a little bit of housekeeping to get out of the way before the fun begins… Amazon will need a little further information, covered below. Naturally, you need to make sure the website you’re going to use to participate in the Amazon Associates programme meets the terms and conditions. You should also carefully read the requirements for participating in the EU Associates programme: you can find the requirements here. First, go to the homepage of the Amazon Associates programme and in the upper area, click on the button labelled ‘Join Now For Free’. 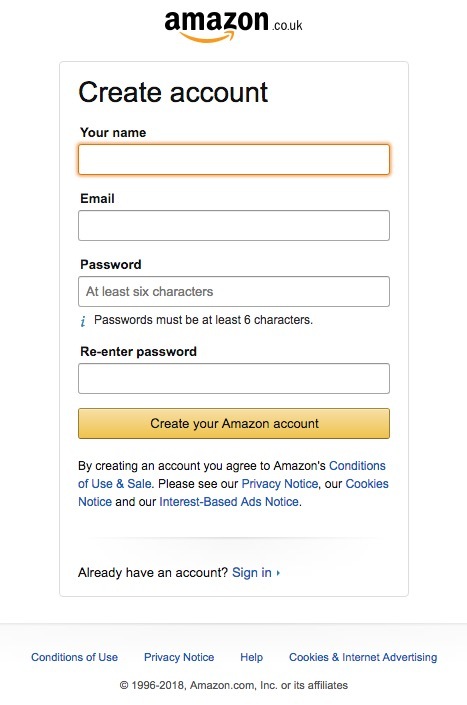 Next, you either enter the email address of your existing Amazon account and the corresponding password, or you join as a new customer by clicking on the ‘Create your Amazon account’ button. If you’re going for option two, you’ll reach the ‘Create Account’ view for new customers. Here, you enter your name, a valid e-mail address and a password of at least six characters, which you then confirm again. Follow the instructions and specify the Payee Name (for later payment for advertising fees), as well as your complete address and phone number. In the last step of this section, you’ll be asked if, as the Payee, you’re subject to United States legislation. Then click on ‘Next’. You now get to another overview, telling you that the registration process refers solely to the UK Associates programme and that you have to apply separately to participate in the Amazon affiliate programmes of other countries. You must also tick who the contact person for this account is, and again, if you are subject to the United States tax code. Then click on ‘Next’. You’ve reached Step 2. 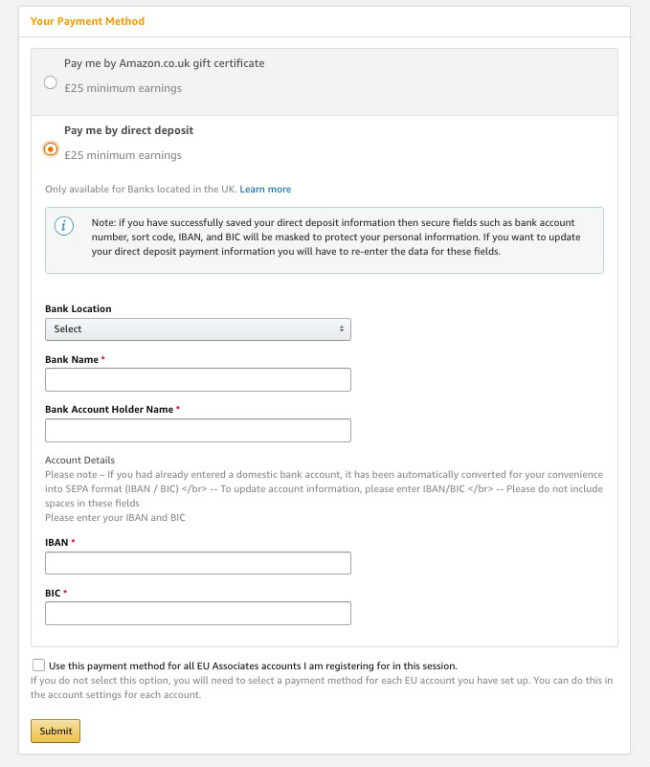 In the ‘Enter Your Website(s)’ field, enter the URL of the website or sites that you’d like to monetise using the Amazon UK Associates programme. Then click on ‘Add’, and your URL will appear in the box below. Do the same in the field to the right of the screen for applications such as mobile apps. 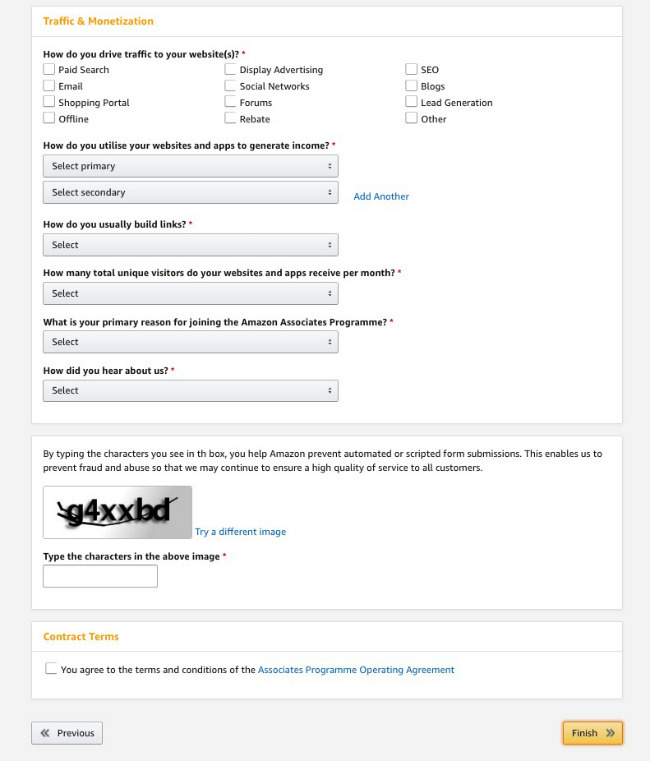 In Step 3, you create your website profile. First, you enter your preferred Associates ID, which also represents your first Tracking ID. These are embedded in Associate links on your website to enable the smooth allocation of any advertising fees you earn. In the two fields underneath, you’ll see the URLs of your previously registered websites. Let’s move on to the description of your web pages. As well as a general description of your site, you also add info about the specific themes your website covers. In the field below, you select at least one category for your website. Similarly, you select product areas you want to promote. After you’ve successfully applied for the Amazon Associates programme, you don’t have to restrict yourself to the product categories specified here. However, the information will help Amazon to suggest Amazon Shop page products to suit the content of your website. After entering this information, you’ll reach the ‘Traffic & Monetization’ page. Here, you explain how visitors usually arrive at your website and add information about the current traffic to your site and how you monetise it. Finally, you confirm the displayed CAPTCHA characters and agree to the conditions of participation; you should read these carefully in advance. Then click on ‘Finish’. 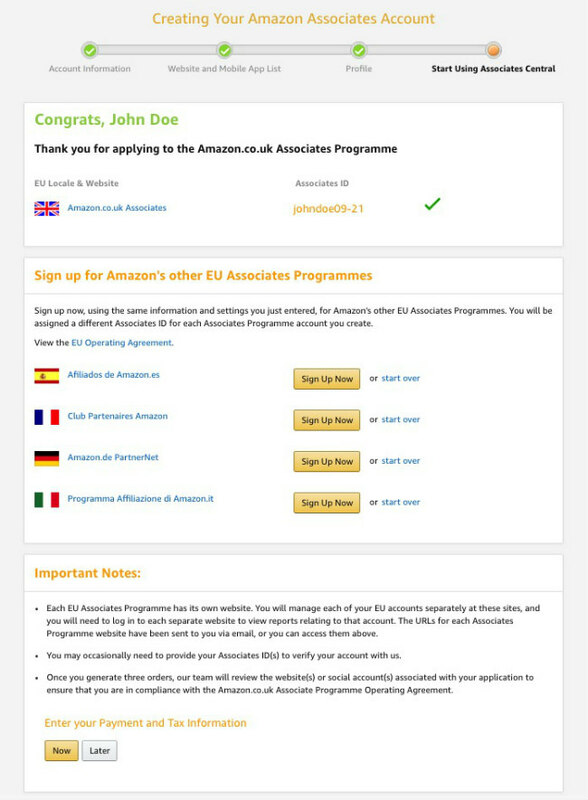 You’ve now successfully applied to participate in the Amazon.co.uk Associates programme. 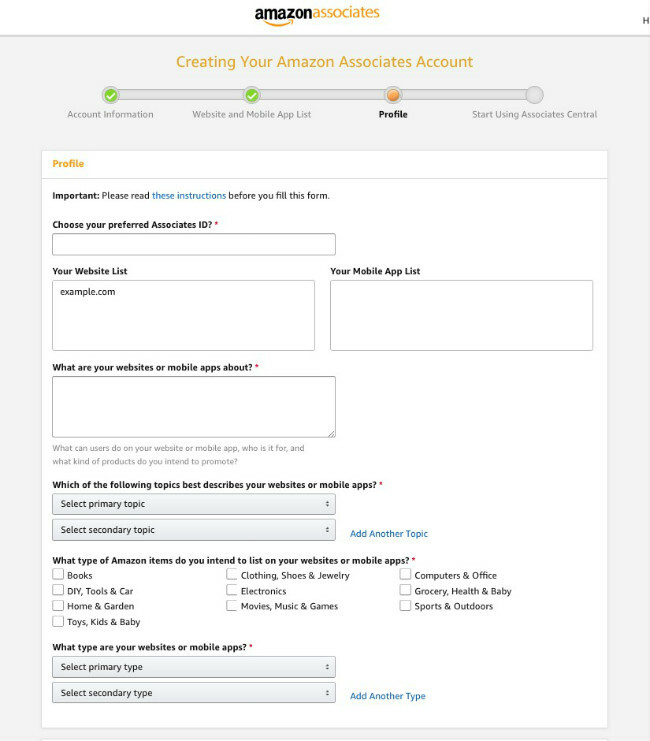 Next, an Amazon Associates team member will review your registration form and assess the suitability of your website. Usually, you’ll receive feedback within 12 to 24 hours about whether your website has been accepted, but you’ll already have access to all the functionality of the Amazon Associates website. In addition, you can sign up for another Amazon EU affiliate programme without having to re-enter all your details. 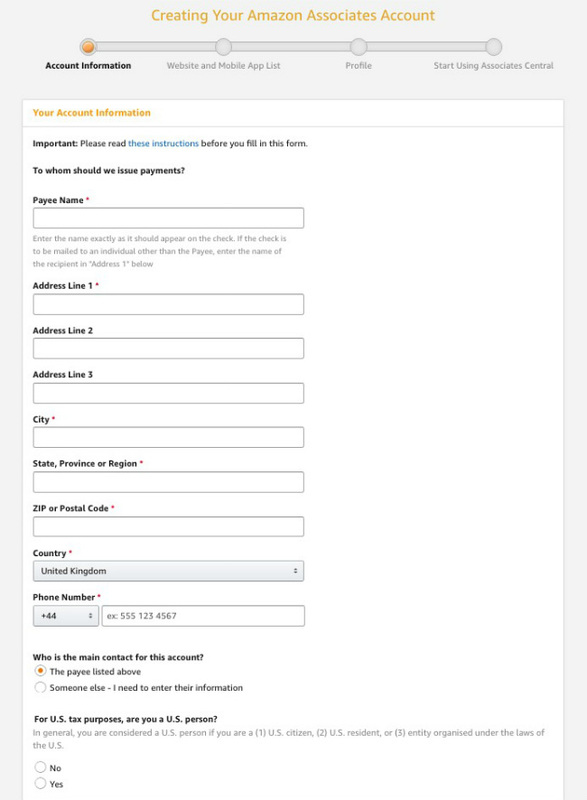 You can enter your payment information by clicking on ‘Now’. In the following view, you decide whether you want to receive payouts as Amazon Gift Certificates or by direct deposit. When you put a check mark for ‘Pay me by direct deposit’, a new window opens. Enter your bank details, and click on ‘Submit’. For answers to any general questions you have about the Amazon Associates programme, have a look at our FAQ overview. As an Amazon partner, you can use Tracking IDs to analyse the performance of your website and its various subpages. 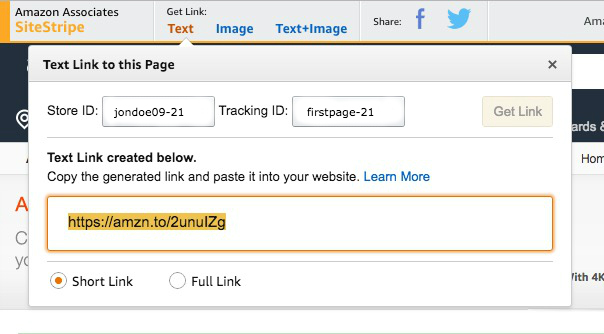 You can create up to 100 Tracking IDs; and if you have multiple websites participating in the Amazon Associates programme, you can add new Tracking IDs to different elements of them to help you distinguish between advertising reimbursements more easily, or to help you take a variety of different measures to test the earning potential of your pages. All advertising fees generated by your different Tracking IDs are summarised under your Associates ID. For example, as an Associate with the Associate ID ‘jondoe09-21’, you could use the Tracking ID ‘firstpage-21’ to track user activity on your first website and with the help of another Tracking ID – for example, ‘secondpage-21’ – you could track various activities, such as capturing and distinguishing clicks on the Amazon button, as well as monitoring the advertising fees generated by your second website. Advertising fees generated using a Tracking ID are summarised under your Associates ID (‘jondoe09-21’ in the above example), and can be viewed in the ‘Reports’ section within Amazon Associates. 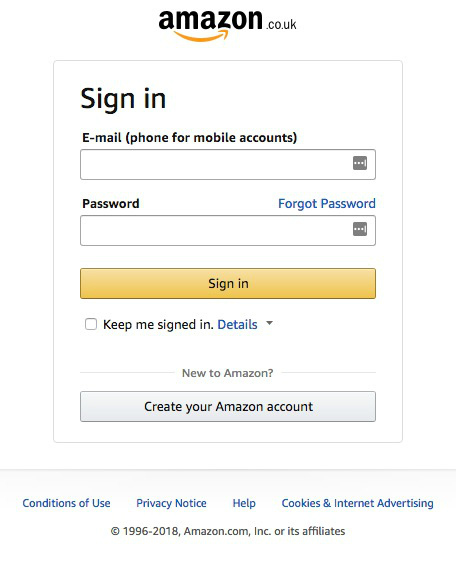 To generate a new Tracking ID, click on your ‘Email Address’ at the top of the Amazon Associates website and then click on ‘My Account’ and ‘Manage Tracking IDs’. Within the Amazon Associates programme, you have numerous pre-designed advertising tools at your disposal. These include text links, image links and banners, and the range of materials extends all the way up to product boxes with individual products, or even a product carousel featuring several products. 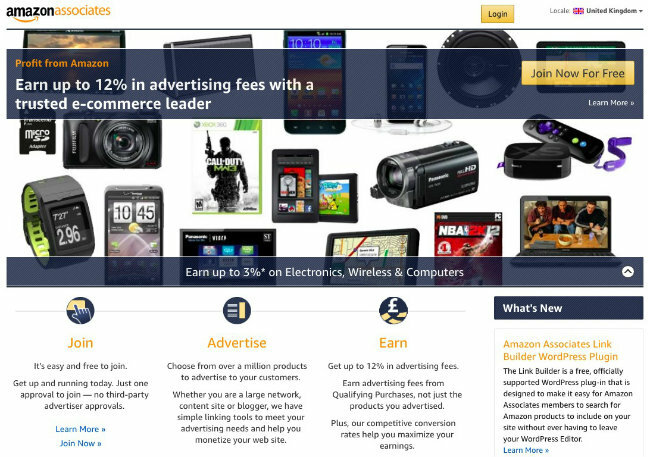 The various advertising tools can be selected from within the Amazon Associates site, and are also available to you via an easy-to-use plug-in within WordPress. They can also be accessed via the SiteStripe app and applied directly from the Amazon shop page. SiteStripe is an application, similar to a toolbar, which you will see on the Amazon.co.uk shop page in the upper left area as soon as you visit the shop page as a participant of the Amazon Associates programme. With SiteStripe, you can save time by instantly creating Affiliate links directly on the Amazon.co.uk shop page, without having to visit the Amazon Associates website. The SiteStripe tool also enables you to quickly and easily create an Affiliate link to each Amazon.co.uk store page in just a few moments, and even share it on Facebook or Twitter at the same time. To use Site Stripe, you simply navigate to any product page on the Amazon Shop and click on the button for a Text, Image or Text + Image link. Even a ‘short link’ can be created as a text link with just a few clicks. SiteStripe also enables you to access important Amazon Associates functionality, bypassing the need to visit the Amazon Associates website. You can customise SiteStripe to your individual needs and workflow and, if necessary, hide it from the shop page altogether. You can find more information about SiteStripe here. Another handy time-saving tool for Associates members is the Amazon Associates Link Builder Plug-in for WordPress. 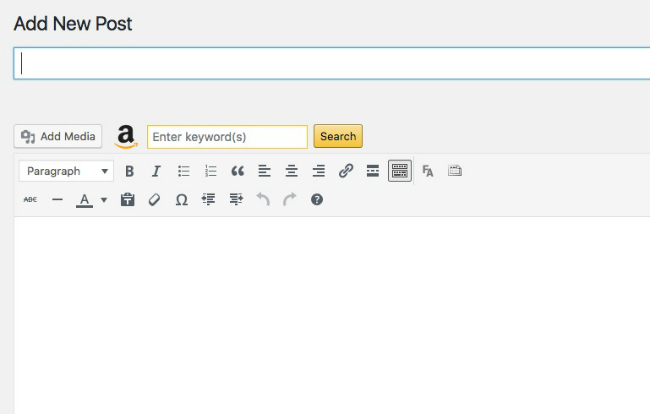 Using the plug-in, you can search for Amazon products directly from within your WordPress Editor and link them to your website. This gives you real-time access to current prices and up-to-date product availability. By using the Amazon Associates Link Builder Plug-in, you can not only create text and price links, but you can also choose templates for different types of professional-looking product boxes, which can include pictures, prices, and other product info. It’s also possible to create your own Templates to speed up your content-creation process. To ensure that you’re properly allocated the advertising fees due from a successful order via one of the Affiliate links integrated into your website, it’s important that the Affiliate link contains a Tracking ID. This is the only way to ensure that both a click and a subsequent order can be correctly assigned to your Associate ID. 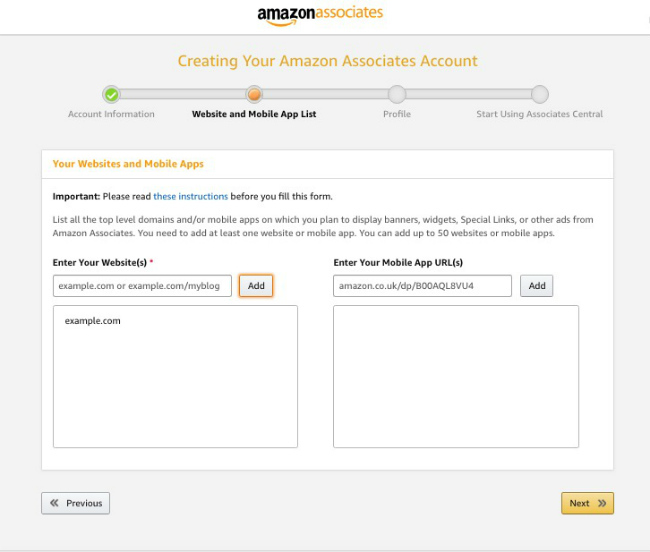 When using SiteStripe to create an Affiliate link, or Amazon advertising materials such as banners or widgets from the Amazon Associates website, your Tracking ID is automatically included. The same applies when using the official Amazon Associates Link Builder Plug-in for WordPress. The Link Reviewer gives you the option to check a manually created Affiliate link for possible errors. However, there are other requirements that must be fulfilled in order for a click on your Affiliate link to lead to an advertising fee. For all orders placed at Amazon.co.uk by a visitor to your website via an Affiliate link – and for all product orders placed in the shopping cart by them within 24 hours – you will receive an advertising fee. This is valid as long as the shopping cart doesn’t expire (usually after a period of 90 days) and that the order is completed by the customer. However, the 24-hour window opened by your Affiliate link closes as soon as the customer has placed their order, or returns to Amazon.co.uk via another Affiliate link. As soon as this window closes again, you won’t earn any further advertising fees through subsequent purchases. However, if the customer once again reaches Amazon.co.uk via one of your Affiliate links, a new 24-hour window opens.